It's an exciting time to be an astrobiologist looking for life beyond Earth, with signs of water spouting up all over the solar system. In the latest example, NASA's Cassini spacecraft has delivered clear evidence that, far beneath the icy crust of Saturn's small moon Enceladus, hydrothermal activity may be at work, similar to what we find in some life-friendly environments on Earth. That makes three leading contenders for bodies in our solar system that possess life-friendly conditions. Jupiter's moon Europa hides under its icy crust what may be the largest ocean in the solar system, and there has been a renewed interest in mounting a mission to explore it. And NASA's Curiosity rover continues to quench our thirst for finding signs of liquid water in Mars' distant past. Curiosity is currently prospecting the water-deposited sedimentary layers on Mount Sharp, left behind by ancient surface seas. It has been a decade since Cassini first captured images of plumes of material erupting from great fissures in the icy crust of Enceladus, material that it later identified as water mixed with smaller amounts of nitrogen, methane, and carbon dioxide. These plumes told us there was liquid water beneath the surface. We thought at the time that the water may be held in some kind of geyser chamber heated and pressurized by tidal energy supplied by Saturn's gravity. Over its decade of exploration Cassini's Cosmic Dust Analyzer (CDA) instrument has also repeatedly detected microscopic solid particles flying about the Saturn system. Researchers have identified the particles as silica grains -- the same material found in sand and quartz. The very consistent sizes of the particles (the largest between 6 and 9 nanometers) has led scientists to conclude that they were produced by a very specific process: hot, alkaline liquid water super-saturated with minerals experiencing a sudden and drastic drop in temperature. Where, it was asked, might these conditions exist in the Saturn system, and by what mechanism would the silica grains be delivered into space, where Cassini detected them? 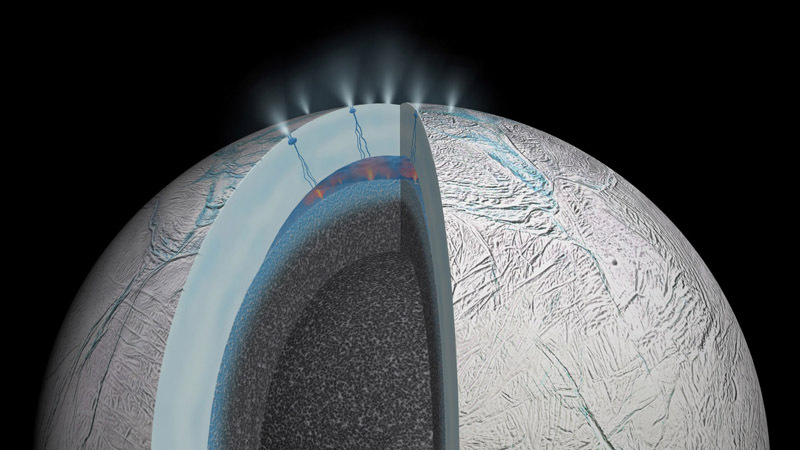 Enceladus, with its liquid water ocean and water vapor plumes spraying into space, satisfies both of these questions. Similar conditions exist here on Earth. On the floor of our ocean, usually at the boundaries of crustal plates, are found hydrothermal vents. These are underwater hot springs formed when seawater, percolating into the ocean floor, comes into contact with hot magma. Plumes of hot water erupt through vents in the ocean floor, carrying dissolved minerals. Some of those minerals solidify on contacting cold ocean water. The mineral structures that build up around the vents, along with the smoke-like plumes that spout from them, are called "black smokers" and "white smokers." 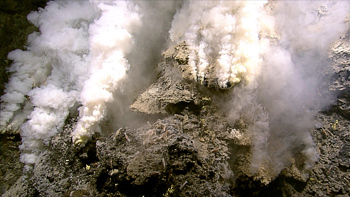 Black smokers form around hotter hydrothermal vents, and get their black color from iron monosulfide. The less common white smokers form around cooler vents, their white color coming from chemicals like barium, calcium, and silicon. These deep ocean smokers create environments that support life: communities of organisms sustained entirely by heat and chemical energy coming from Earth's interior, no sunlight required! And though the life forms found around the vents probably originated from Earth's sunlit surface, this does not rule out a genesis scenario where life might originate within such an environment. And that's where Cassini's discovery gets really exciting. Analysis of the silica grains detected by Cassini indicate that hydrothermal activity similar to that on Earth is taking place on the floor of Enceladus' ocean, where water, under great pressure at depth, interacts with heat and minerals emerging from the moon's interior. For the hydrothermal vents to produce these particular silica grains, the temperatures must be at least 194 degrees Fahrenheit. 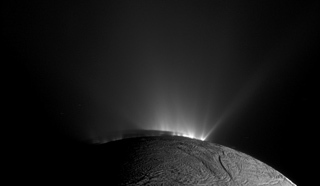 If not super-hot black smokers, might Enceladus have something like our own white smokers going on? The possibilities are tantalizing. Finding even one microbe out there would, in an instant, resolve one of the most profound scientific, philosophical, and human questions of all time: are we alone? That question was once phrased, "Is there life out there?" These days, it's starting to sound more like, "How many places will we find it?"